How Does Concrete Core Drilling Work? Here at G&M Services, we can provide you with concrete core drilling services. However, before the process can begin, you might have a pressing question: how does it work? Here at G&M Services, we can provide you with concrete core drilling. However, before the process can begin, you might have a pressing question: how does that work? 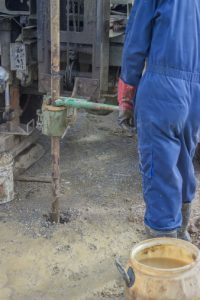 Here are some of the fundamental things to know about this technique so that you know what to expect whenever this type of drilling is needed on your next work site. When concrete core drilling is done correctly, it creates a hole in a concrete surface. This surface can either be a wall, floor, or ceiling. However, this process is most often completed in walls and basements. These reason for this is that concrete core drilling makes it easier to run utility lines through homes, businesses, and apartments. However, it’s also important to do concrete coring in such a way that the wall won’t be compromised – that’s why it’s so important to leave it to the expert technicians at G&M Services. To ensure the best results, you will need the highest quality core drills. These drills have hollow points and bits that are roughly cylindrical. The size of the bit depends on the size of the hole that is needed, and this is where possible complications can arise. Although this process seems simple, that doesn’t mean there won’t be complications and obstacles to overcome. Sometimes, you will need to use different tools. For instance, a hand drill can make a difference for small holes, such as those for putting in phone lines and Internet cables. That said, the job will occasionally call for a wall-mounted drill. If you need to make multiple identical holes, then it is best to use a wall-mounted drill for concrete coring. Concrete core drilling can also run into problems and issues. For example, it’s not unheard of for a drill bit to get stuck in a wall. You need to have enough water to help facilitate concrete core drilling; without it, the possibility of jammed drill bits becomes more likely. The dust released by the drilling process can be dangerous to your workers, especially if you are concerned about the presence of silica dust and asbestos. Friction can also cause drill bits to slow down, bend, or even break. Whenever this happens, the bit needs to be replaced before the concrete work can continue. This entry was posted on Friday, September 28th, 2018	at 1:10 pm	. Both comments and pings are currently closed.